MAKATI, March 2011 – This season, San Marino will be giving away a Samsung Galaxy Tab to one creative individual who can come up with the best sandwich recipe using the San Marino Corned Tuna and the San Marino Chili Corned Tuna variants. 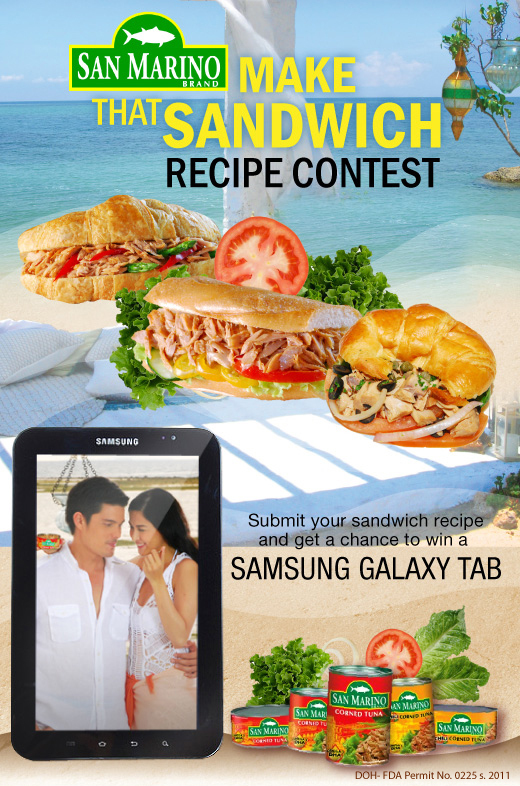 Philippine residents are invited to submit their sandwich recipes on the San Marino website. Participants can come up with and submit as many recipes as they can, but only one recipe per person will be qualified in the contest. Six winning sandwich recipes will be chosen to be up for voting on Facebook. The top six sandwich recipes will be determined using the following criteria for judging: originality, uniqueness, creativity, and integration of San Marino Corned Tuna product. The sandwich recipe with the most number of ‘Likes’ by the end of the voting period wins. The Make That Sandwich Recipe contest schedule and mechanics can be found on the Sandwich Recipe Promo Tab of the San Marino Facebook Page.